A sweetness descends upon and envelopes me even before I finish my prayers. I’ve just settled onto my couch to meditate. My eyelids closed only a couple minutes ago, shutting out the cathedral of redwoods beyond my windows. My words, “Make me an instrument…” fade in my mind, like ink on water. Instead, the word “sweet” rises up. There’s a sweetness here. It’s the quality of Mother Mary’s energy this morning. It’s a sweetness I haven’t known. A sweetness that has probably come to me many times in my life in the form of women offering a particular quality of friendship that I’ve pushed away and run from. But this energy, here, now is a feminine sweetness. Sister softness. The kind I can rest my head upon. A sweetness that wraps her arms around me to say she is there no matter what. That I don’t have to do anything. Not do anything to be loved? My nervous system isn’t wired that way. But there it is. Here she is. My body trembles a little. Hard to believe. But her sweetness is unwavering. I breathe in more deeply to take in the honey of her. And another breath. She enters and descends into me, like a pink feather, wafting into my lungs and heart. My body drinks in her presence and trembles at the same time. When she reaches my belly my body starts to shake like a small earthquake. Waves of fear ripple from my belly throwing something up and out. Even after journeying together for so long how hard it is for me to trust her. Even after all the times she’s come to me how hard it is to fully believe she’s really there. Here. With me. No matter what. How hard it is to fully believe the Divine’s unfailing promises, presence, and power in my life. How many times I’ve turned away and distracted myself with work that’s known and accepted in the world. With taking yet another course. With the Internet. She, Queen of Heaven, has come to me, asking, asking, asking me to walk with her to carve a new path. One that doesn’t exist. One you don’t go to school for to get a degree. One where I get to walk with her. Walk with Her!? Work with Her!? I have not believed. It’s been easier to shoo away her messages like a nice visualization you think is make-believe. But now, as the earthquake in my body throws up lava of mistrust and disbelief, a corridor of light opens before me. And the words burst from my lips, If you lead me I will follow. 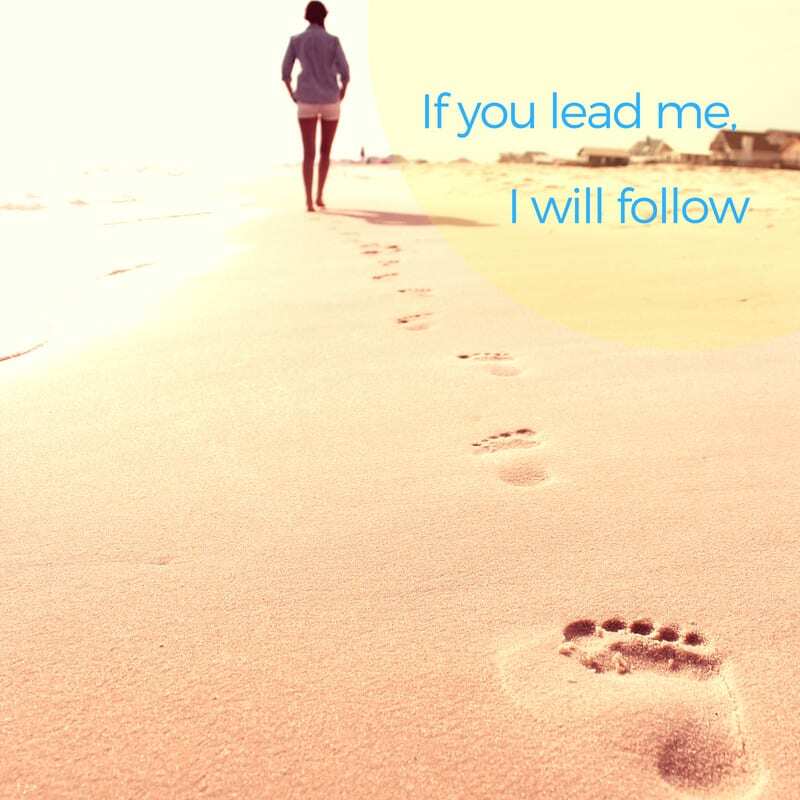 If you lead me I will follow. No matter what it looks like. No matter where I may go. At that instant a shining crown appears four feet above my head. It is glorious not because of its precious metal or gleaming jewels, but because it is the crown of the Divine Feminine. With the radiance of more than a thousand suns. It is being placed upon me. She is placing it upon me. And the thundering radiance of a thousand suns and moons and stars showers down all around me. Not with success, fame, material wealth, or whatever the marketplace and world may chase. But with the Crown of the Divine Feminine. To your will, not mine. I am to walk in the world as her. I am to speak as her. Be her mouthpiece. Still, I am aware of the stark disparity of my identity. I feel like two people: one with bedraggled worth, the other crowned as the Divine Feminine. And the bedraggled part drags in its always question, like a tattered rag: Why me? For the first time, another voice arises in me to silence it. Perhaps it’s time to stop asking that question. And just accept what is.